Moving from combustion engines to batteries. One of the main differences with Electric Vehicles and Internal Combustion Engine vehicles is the way in which their fuel is replenished. With a car with an engine, you need to fill it up with Petrol or Diesel. With Electric Vehicles, charging the batteries is the equivalent of filling a Petrol tank. Unlike combustion engines, there’s currently no way to instantly add range to electric vehicles, as you would when topping up with Petrol or Diesel at dedicated stations. Although ‘Range Anxiety’ can be an issue for new users, a simple change in approach will make all the difference. You may find a ‘little-and-often’ methodology works best, but either way, charging points can be found all over the country, even in local supermarkets, with more being added daily. We’ll guide you through the options. The most convenient time to charge a vehicle is when there are long periods of inactivity. For some E.V users, this naturally occurs when they come home from work in the evening. All of our cars come with a domestic 3 pin plug charger, that will charge wherever there is access to a standard plug socket. This is the slowest method of charging, however it may still add enough range to the vehicle depending on your usage, with around 95 miles added for 12 hours of charge. Although using a standard socket is entirely possible, a more suitable way of charging at home, is to have a dedicated charge point installed. Costs are around £350 after the OLEV government grant for a 7kW charge point, enabling 3x faster charging, taking the 12 hour charge time down to 4 hours. You may believe that charging at home is only suitable when off road parking is available, but change is on the way, with steps are being taken to help those who do not have off road parking. Portsmouth City Council have installed a number of Ubitricity chargers, that utilise existing street lights and with other innovations such as the kerbside chargers from Connected Kerb, charging at home is becoming more accessible everyday. There is also a petition to change the law, calling for terraced house owners to be able to install chargers, with a concealed cable across the pavement to their car. Using public charging stations can be a minefield and very daunting for new E.V users. There are many companies operating the points, all with different methods of handling the charging transaction. We advise researching the charging stations along your journey or in your local area so you can prepare, and avoid a potentially stressful situation. A E.V map tool such as ZapMap becomes extremely useful for this research. ZapMap is a free to use App and website that displays all the charge stations over the U.K, the current status of the station (showing ones that are not in operation/faulty), the operator and their tariff. Another feature is the ability to filter the power output of the station. Most home chargers output at either 3.6kW (slow) or 7kW (fast) but for businesses that have a 3 phase supply there are also AC charge stations that output 22kW (fast). Some Supermarket’s have started to install charging stations in their car parks, and whilst they are generally free to use, they are also slow (3.6kW). This is where a little and often approach can help ease range anxiety. Imagine if there was a Petrol pump next to your parking space that gave out you a couple of litres of fuel for free! Some retailers such as Ikea have implemented DC charging stations that are capable of Rapid charging vehicles with 50kW of charge. This vastly reduces the amount of time it takes to fully charge a vehicle, with a typical charge only taking 45 mins. As battery sizes increase, so does the time to charge them. Advances in charging technology are keeping these charge times steady, with 100kW DC chargers starting to rollout throughout the U.K. Charging at AC stations usually involves using your own type 2 charging lead, which we provide with all of our vehicles. DC charging stations have a lead tethered to it, and are a different shape to the cars AC port. The most common charge ports can be seen below. CCS and CHAdeMO are found on cars such as the BMW i3 and Nissan Leaf and are for DC Rapid Charging. Type 1 chargers are no longer offered on new vehicles in Europe, but can be found on the Vauxhall Ampera and first generation Nissan Leaf. 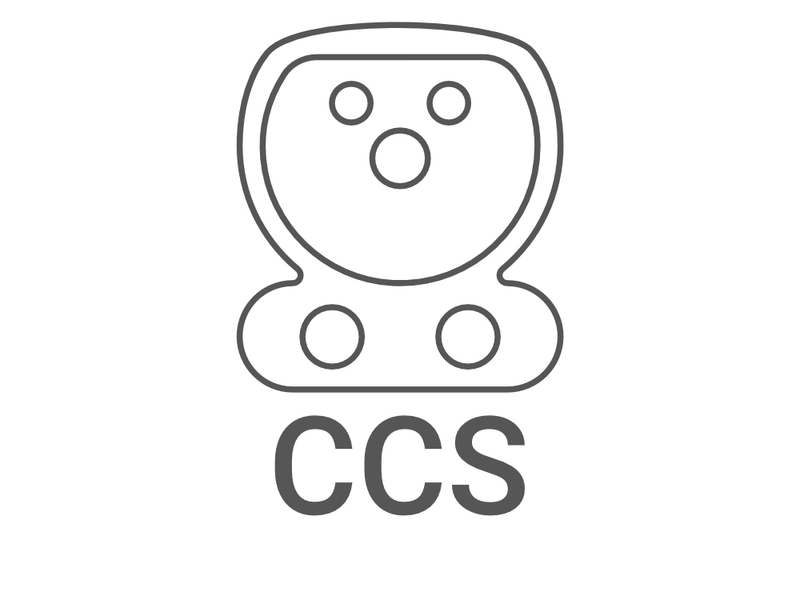 Type 2 is now the standard in Europe for AC charging, and combines with CCS. Tesla also use the Type 2 connector in Europe for their Superchargers. Most charging stations are now operated via a card or app, which handle the charging transaction. As with most online based services, you register for an account and add payment information into the operators app. This then allows them to bill you for the charge. An older alternative method is to sign up directly on the operators website, with them sending you a “charge card” in return. This work in exactly the same way as the mobile app but works well in bad signal areas. Instavolt have begun installing stations that work with contactless debit/credit cards, removing the need to register an account or have an app. The images above show a Nissan Leaf Rapid charging (CHAdeMO), an Instavolt contactless Charging station, Ubitricity’s app and New Motion activation card and tag..
Having developed their own supercharging network, Tesla have the enviable position of being able to provide a charging service which is second to none. Each Tesla car is connected the internet, and has a payment account registered to it. This allows the car to talk to the Supercharger, authorising the charge with no input from the user. It is simply plug and pay. The car then displays the costs and all charging information on it’s main screen. Some Tesla models even came with free supercharging for life when first purchased. In Europe, Tesla’s are compatible with all the Superchargers regardless of the country they are situated in.